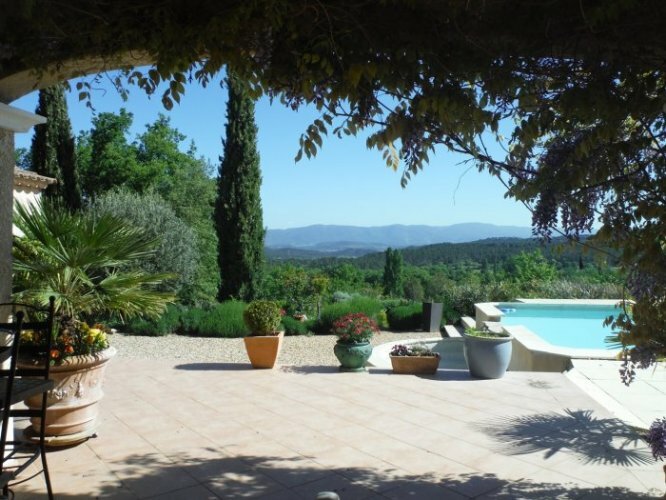 Description of Property: The house is a contemporary home situated in a naturally privileged environment with an exceptional view overlooking the Luberon Hills in the heart of Provence. The 12.000m² (approximately three acres) property stands on the edge of a forest in the countryside five minutes from the charming typically Provençal village of Rognes. Bedroom 1: with a queen size bed and an en-suite bathroom. Separate toilet close by. Ground floor bathroom: shower in bathtub and two hand basins. The toilet is in a separate location close by. First floor: bath tub, separate shower, toilet, hand basin and heated towel rack. 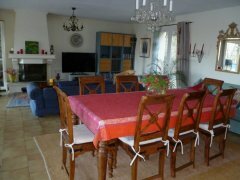 The lounge/dining room (41m²) has large windows allowing you to enjoy the view of the Luberon. The dining table seats 8. There is a large flat screen TV with cinema surround sound system, DVD/Blu Ray player and a large selection of DVDs. The decor is eclectic and colourful. Fully equipped kitchen, including: cook top, oven, dishwasher, microwave, coffee makers, hot water jug, fridge/freezer. 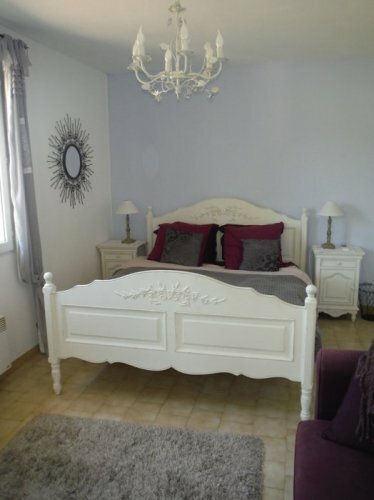 Bedroom 2 with a double bed. Bedroom 3: with a queen size bed. Bedroom 4: with a queen size bed. Laundry with washing machine and separate dryer. It has also an Exercycle, a workout bench and some weightlifting equipment. PC with internet access. Outside Amenities: In front of the house is a large sheltered terrace enjoying the fine view with easy access to the swimming pool (6 metres x 12 metres, unheated). It also has a new Weber gas barbecue and furniture for outdoor dining. The outdoor dining table seats 8. There is another table seating 6 by the pool also with excellent countryside views. There is also table tennis and badminton equipment. 12.000m² (approximately three acres) of land, non fenced. 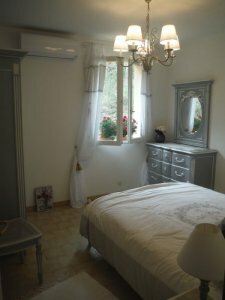 After the automatic wrought iron gate is a sweeping driveway taking you to a double car park area and Mediterranean garden with lavender, roses, olive and cypress trees. Surrounding Area: Rognes is perfectly placed between Luberon Natural Park and Bouche-du-Rhone. It has all the necessary shops e.g. boulangerie, grocery, greengrocer, etc. It is a village renowned for its proximity to the yearly piano/jazz festival held every July/August in La Roque d’Anthéron only a few minutes away and the many vineyards that abound for wine tasting. Aix-en-Provence, 20 minutes away, is a lively, cosmopolitan town with many festivals, restaurants and tri-weekly markets, home to Cézanne and the mountain he painted and loved, St. Victoire. Also near are Avignon, with the papal palace and theatre festival, Marseille and its old port, Mediterranean beaches. 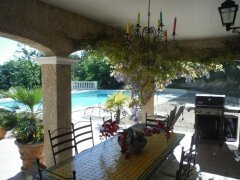 Nearby are the Provencal villages of Loumarin (ten minutes) and Ansious, both of which have chateaus and fine restaurants. In the Luberon hills you will discover the fascinating village of Roussillion with its ochre cliffs. Bonnieux, famous for its stunning views of the region and its hiking tracks in nearby forests. Within easy reach are also plenty of markets selling Provencal produce, cafes and restaurants, two bearing Michelin stars. Other places of interest are St. Remy de Provence, Avignon, Gordes, Apt, Cucuron, the gorge de Verdon, Fontaine de Vaucluse, Abbaye de Sénaque, the bustling port city of Marseille and Nice. The area also offers many opportunities for hiking, biking, walking and horse riding (additional information will be provided in our house). The closest beach is the Corniche in Marseille about 45 minutes away. The charming seaside resort of Cassis east of Marseille, with its many seafood restaurants and beach is about 1 hour away. Carro, west of Marseille on the Cote Bleu is approximately 1 hour away. Saint Maries de la mer in the Camargue famous for its wild horses, horse trekking and flamingos has a beautiful long beach. Spanish ambiance complete with bull fighting and flamenco music. Within 2 hour exciting Nice and St. Tropez. The nearest airport is Marseille Marignane, 45 minutes away. The TGV station of Aix-en-Provence is 35 minutes away. The TGV station of Avignon (Eurostar terminal) is 45 minutes away. A private or rental car is necessary. Rognes, 1.2 kilometres. Aix-en-Provence, 20 kilometres. Avignon, 50 kilometres. Marseille, 55 kilometres. Nice, 200 kilometres. Each bedroom and the lounge is equipped with a reversible heat pump for air-conditioning in summer and heating in winter. Open fireplace in the lounge. Mains water. Private water. Septic tank. Electricity. Telephone. WiFi Broadband Internet Access. Television. Satellite TV. DVD. Hi-fi. Pricing Info: 2,500€ per month, all costs included.